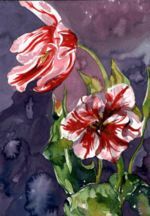 When I was painting this in watercolor, I was looking at a bunch of exquisite tulips. I had fallen in love with the colors and patterns on the petals and wanted to capture that as well as the exquisite curves to the stems and petals. This is a dramatic, showy piece and would look well in any environment.